Spring is definitely on its way and the weather, dare I say it, is warming up. Which means it’s time to ditch the skinny fit jeans and bistro crop trousers that Boden do so well and get those legs out. There should be a sunglasses warning here… my legs are so white they might just do some damage to the eyes. The Hawaiian tan has long gone and I have bared my legs for the first touch of sun. Well how else was I going to bring you a how to wear a pencil skirt two ways piece? As Brand Ambassador for French fashion online destination, La Redoute, I have been styling out their French Style Made Easy outfits for a while now. I love a pencil skirt for the office, in standard issue black of course, but I don’t want it to be plain and boring. I can be a little casual in my day job but I do like to look smart. 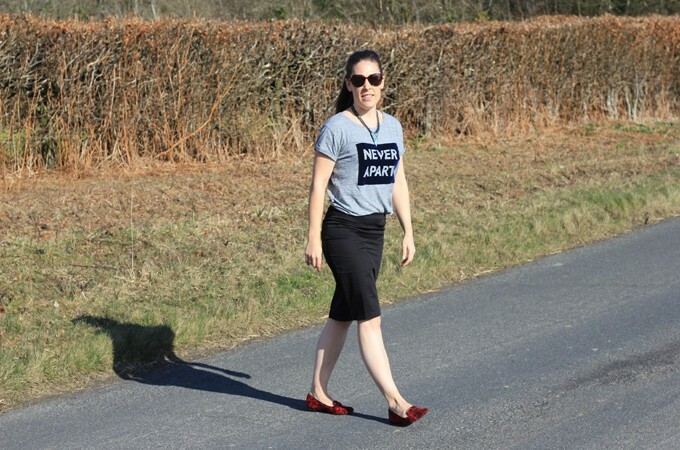 So here I am styling a La Redoute pencil skirt two ways for spring. First up I team the black pencil skirt with a grey marl Sandro tee-shirt. Bought at Selfridges last season for London Fashion Week. I love the thickness of the tee and the velvet texture of the “Never Apart” text. Worn with the black skirt it adds a little casual glam, especially when I added the Souksy Spike Necklace to the look. I realise, post photo that flats really don’t work for me for this skirt. My legs are not elongated and the outfit would look better with heels. But you live and learn. In any case, I do love burgundy leopard print pumps from La Redoute. For my second look, I have gone a touch smarter with this gorgeous Bamboo print Overlay top from Whistles. It now seems to be out of stock, but the print is also available in other pieces so it’s worth while taking a look. Monochrome will be a big trend again for Spring/Summer this year, so get in there early. Black and white always work well together, they look smart and can really make an outfit look together. I love the feel of the top and it sits well with the pencil skirt. Glamorous yet practical for the office. One of the outfit combinations that I have put together is available for one lucky reader to win. You do have to be a UK size 8 to win, or know a size 8 woman who you’d love to gift the prize to. There is just one outfit to giveaway. The long-sleeved blouse with transparent top in steel blue, a great colour for this season and the flared tutu skirt in tulle in black, with cute polkadot. Entry via Rafflecopter. Any comments left containing the answer, will not be published. UK entrants only. The winner will be drawn at random and notified by email. The competition will run until Monday March 23rd at 9am GMT.